When you think about what the average person weighs and how all of this weight is distributed when you sit down, it starts to make sense to invest in a seat cushion. These cushions can take the pressure off your back, buttock, thighs, and coccyx and give you the support and comfort you so sorely need throughout the day. Navigating your way through the seat cushion market can be troubling though, with everyone claiming to be the best travel seat cushion or the best seat cushion for office chair. We’ve compiled this thorough buying guide to show you exactly what features you need to get the seat cushion of your dreams whether it’s for work or relaxation, and what to look for in a quality product. To start things off, we’ve highlighted our top picks for the best seat cushion and have found products to suit all prices and purposes. Whether you’re looking for a cushion to relieve the pain and discomfort of a medical condition or just something to give you better support at work, there’s sure to be something here that suits. The seat cushion market is one that’s so varied it can be overwhelming to navigate through, and within this innovative product is so many different designs. To make matters easier, we’ve narrowed down our search to come up with the best car seat cushion, best standard seat cushion and best cushion with a backrest so you’ll be better equipped to find your perfect fit. Most of us spend a lot of time in our cars without even realizing it, and there are some who even work from their vehicles. Sitting in this position can be extremely uncomfortable and do a lot of damage, so investing in a auto seat cushion is a must for everyone. You might not realize it at the time, but traveling in your car each day even just during the commute to work can be doing serious damage to your back. Not to mention those who suffer from existing back pain or conditions like sciatica, a seemingly easy journey can turn into a nightmare. 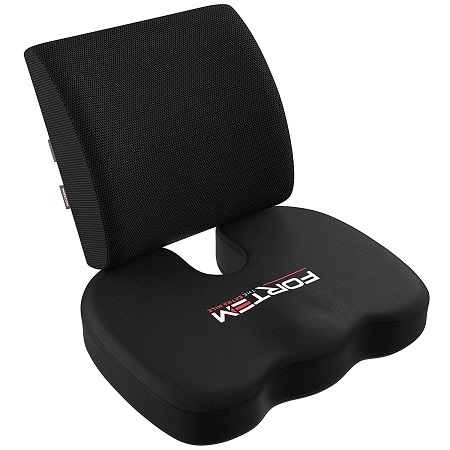 The Fortem Seat Cushion is the perfect choice for someone looking to relieve this pain and give themselves then comfort they need in the car, and it’s our top pick for the best car seat cushion. What sets this cushion apart from others is the versatility it has to fit in all kinds of vehicles including trucks, SUVs, and all cars. As an added bonus, you can even take your Fortem Seat Cushion on the plane to add to its traveling repertoire and save yourself from another painful trip in the air. Fortem has thought of everything when designing this pillow, and it comes in two parts with a seat cushion and lumbar support. The back pillow is to support the natural curve of your back and the seat cushion relieves the pressure on your coccyx, spine, hips, and thighs to give you the most comfortable seat of your life. Some customers have mentioned that the seat is a little small for all body types, so it’s best to do your measurements before investing. The Fortem cushion measures just under 18 inches at its widest, so if this sounds right for you then you shouldn’t pass it up. This cushion has all the things you look for in an easy to care for and quality made product, with a convenient carry handle that makes it great for travel, a 3D ventilated mesh cover that can be removed and washed with ease, and a lifetime warranty so you know it’s been made of premium materials and quality craftsmanship. Some people prefer additional support from their seat cushions in the form of a backrest, and that’s exactly what you’ll receive these ergonomic designs. We’ve found the top-rated seat cushion with backrest that will give you double the support when you need it most. Although the main purpose of these seat cushions is to provide you with support from underneath, there are now some great models available with the added bonus of a backrest. 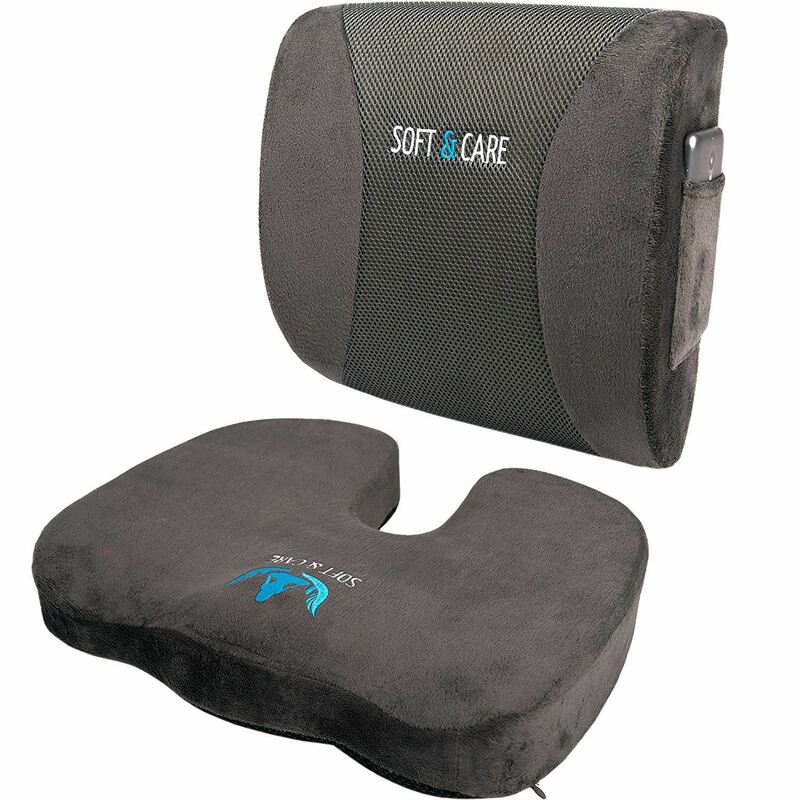 Soft & Care have designed this set of premium cushions for use at work, home, in the car, traveling, and anywhere you might need them for comfort. The Soft & Care Seat Cushion has plenty of features on offer including a carry handle, storage pocket for your smartphone or MP3 player, two adjustable straps to keep the cushions in place, and zippered cover that removes with ease for cleaning. The cover is even made from soft velour so it’s breathable and comfortable at the same time, even in warm conditions. These cushions are made from high-density memory foam which reacts to pressure and heat to perfectly mold around your body. The reviews have stated that this memory foam is the perfect mixture of firmness with comfort and that’s exactly what you should be looking for in this time of seat cushion and backrest combination. The only real issue with the Soft & Care Seat Cushion is a lack of non-slip surface on the bottom on both the backrest and cushion, as some users have found it can slide around a bit. There are two adjustable straps in place that let you tighten it to your seat, but the added feature of this nonslip material would have really ensured it stayed in place. This small issue aside, there’s so much to love with the Soft & Care Seat Cushion and it’s definitely our recommendation for someone looking for a combination of the two and the best orthopedic seat cushion. The seat will support your coccyx and relieve the pressure felt in your back, thighs, and buttocks, while the lumbar cushion will cradle the natural shape of your spine for comfort and support, giving you two amazing products in one. These are general purpose cushions that are best suited for long days at work or sitting at your desk in the home office. We’ve narrowed down our search to the top three seat cushions and found one clear winner from the bunch. You have probably heard about the Purple brand already, since this guys made a big splash with their marketing. 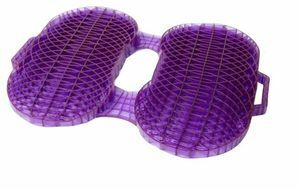 We got curious to learn more about them, and upon finding out that Purple's developers are a rocket scientist (really, check their website) and a comfort tech genius, we decided to give Purple seat cushion a try. And, boy, did it not disappoint us. It became our favorite cushion...ever. So what is there so special about this cushion? The answer is - a hyper-elastic polymer. Yep. Doesn't sound like much, and sure enough doesn't sound...comfortable. But it is! It allows your weight to be distributed evenly while also letting the air flow through the pillow, giving you that ultimate experience of sitting on a cloud. No pressure points. You know you are sitting of course, but what a relief it is when you hit this purple mesh. Purple cushions come in a variety of shapes, so if you prefer a cushion that is lighter and easier to carry around, Everywhere Purple®Cushion will be a light and compact version for you. It also is one of the most affordable, going for about $35. The Royal Purple Cushion, which we sit on every day now, is one of the most popular options, offering 2 inches of cloud-like seating goodness. It is quite wide and bulky, though, so if you are planning to walk around with it a lot - it will not be the best option. Purple goes on to offer the Ultimate cushion, which is even longer and wider, and everything you can think of in between. All pillows come with a removable case that is super easy to wash.
On the downside...the only thing we can come up with is the price. The Royal cushion we settled on for our everyday use goes for about $79, but looking back at how sitting felt like before and what it feels like now - it's totally worth it. Sitting on a Purple cushion is something you have to experience for yourself to really appreciate the technical ingenuity that made this possible. And if you decide to go for it - try the Egg test. You'll be amazed. As one of the premium brands of supportive and ergonomic cushions, it’s no wonder that the Aylio is our top choice for the best seat cushion. This cushion is so versatile that it can be used by everyone including truck drivers and office workers, regardless of your size and weight, and you’ll have no problems sitting on it day after day. With a cutout C-shape design, this pillow allows you to take the weight off your coccyx and help you relax, so it’s perfect for people suffering from conditions like sciatica. Those who don’t have any pre-existing conditions will find it useful for keeping them comfortable, supported and improving their posture, which guarantees no future problems for your back or neck either. This pillow has been designed to travel which is easy to do thanks to its lightweight construction of under a pound. With a soft velvet fabric on top that can quickly be removed and cleaned, there’s no need to be without your pillow for long even when it’s time for a clean. There are so many uses that you’ll find with this pillow and thanks to the quality foam within it’s capable of supporting people of all sizes and shapes. The Aylio Coccyx Seat Cushion is ideal for numbness, injured tailbones and spines, uncomfortable office chairs, pregnancy, and general everyday comfort at work and home. Although the cost is slightly higher than the competition, you’ll definitely feel the difference as soon as you sit on it. Some users have suggested that the cushion flattened out over time and there was a need to replace it after a year. As there’s no extended warranty on this the cost will be out of your own back pocket, so perhaps consider a lifetime guarantee cushion if that’s what you’re after. However, for the small cost and daily use you’ll get out of it, it would still make a worthwhile investment. 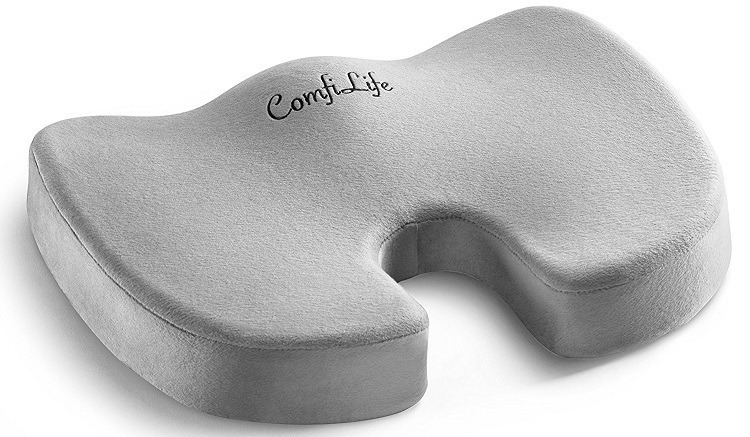 If you’re looking for a more affordable solution to your discomfort, the ComfiLife Coccyx Cushion is by far the cheapest on the market. Because of the lower cost, you might expect the high-density memory foam inside to be a little less firm, but this complaint was nowhere to be seen. The only real issue with this cushion is the size not being suitable for everyone with a 17.5-inch length, but that’s up to each individual to decide before purchasing. ComfiLife have a whole range of ergonomic products on offer, and it’s clear they know what they’re doing when it comes to supporting the body. 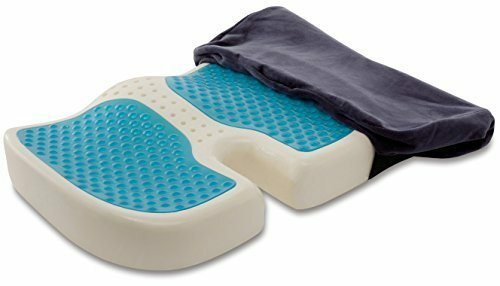 This U-shaped coccyx cushion has been designed to suit your body perfectly and remove pressure from the tailbone to evenly distribute the load of the body. With weight responsive memory foam, you might find that you’ll get less support the heavier you are, so if you need something extra supportive then it’s best to keep looking. For the average user, though, you’ll find the ComfiLife Coccyx Cushion ideal for everything from hip pain to road trips, so it’s truly versatile. There are plenty of notable features included like a zippered velour cover that comes off for easy washing, rubber bottom that keeps it stuck to your chair, built-in handle for convenient carrying, and 100% memory foam inner. All of these things are great to see on something so affordable, and it’s evident that you don’t have to spend a fortune just to get a well-made product. ComfiLife offer a 100% return policy if the cushion is not to your standard or isn’t a perfect fit, so there’s nothing to lose with giving it a shot. Judging by the hundreds of positive reviews, this cushion has helped so many people in ways they never thought possible, so if you’ve been struggling with pain and discomfort then ComfiLife could have everything you need. Another affordable option for the best seat cushion comes from Xtreme Comforts, a brand with a range of budget-friendly and ergonomically supportive cushions, pillows and accessories. This is certainly one of the cheaper options but still worth considering thanks to its features, proving that great support doesn’t have to be expensive. 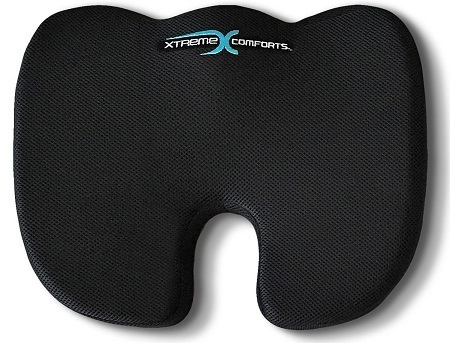 The Xtreme Comfort Seat Cushion has a U-shaped cutout that allows your tailbone to hover over the top without pressure, so you’ll instantly feel the difference when you sit on it. Not only does the contour shape remove the pressure from your body but it also promotes a healthy posture and can help you to keep it all day, even when not on the cushion, so its powers go well beyond when you’re seated. There are plenty of great features included here like the machine washable cover made from a breathable mesh and the special nonslip bottom, but one of the most notable has to be the two-year warranty offered by Xtreme Comforts. It’s rare to see this on a cushion for this low price, so it’s a great indication of its quality and craftsmanship. This cushion has so many great uses including yoga support, pregnancy, arthritis, sciatica, road trips, back injuries and more, or it can be just as useful to give all over support and comfort when you’re at work or relaxing. You’ll find that you want to take your Xtreme Comforts Seat Cushion wherever you go, so a carry handle would have been a nice addition, but because it’s so lightweight you shouldn’t have a problem doing this yourself. Xtreme Comforts Seat Cushion reviews show so many happy customers which is great to see on a cheaper product, proving that you don’t have to break the bank just to get relief. If you’ve been suffering in pain and discomfort then this is a great choice for your very first seat cushion. Which Seat Cushion Should You Choose? There are certainly plenty of seat cushions to choose from that serve a general purpose, but if you’re looking for something specific like the best seat cushion for hemorrhoids or the best airplane seat cushion then it’s recommended to shop for exactly what you need. Even the slightest difference in design feature can have huge results on the feel and support it gives, so you need to listen to what your body needs. 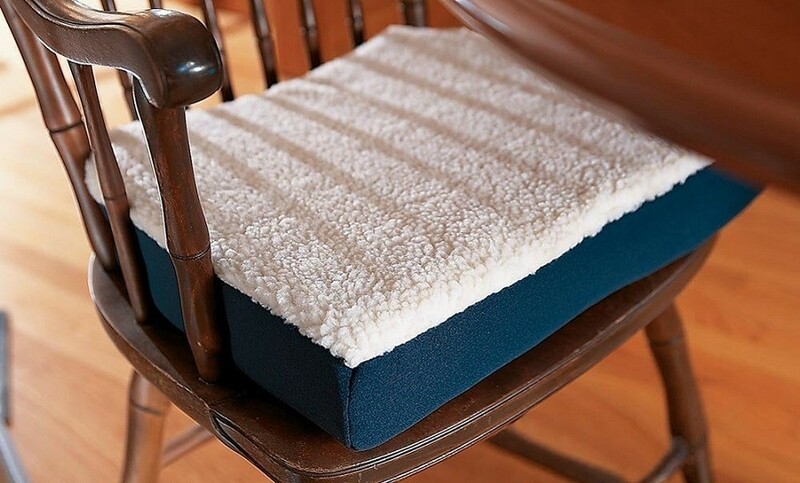 Seat cushions are predominantly best for providing comfort and putting an end to the long and miserable days of sitting on your buttocks and feeling them go numb or sore. But in addition to this comfort, they should also provide support for your back and remove the pressure from your coccyx. 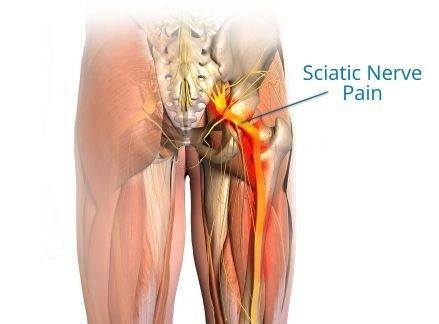 With both of these things combined, you’ll reduce pain, improve your posture and lessen the chance of developing any further medical problems in these areas. Before deciding which of these cushions is best for you, you should think about where and when you’d most likely use it. If you’re someone who travels a lot, either for work on a train or driving trucks for a career, it’s best to opt for one designed for the car specifically. 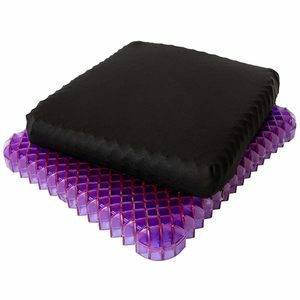 However, if you’re looking for support in the office then either a backrest or general purpose cushion would be ideal. Thankfully, the market for ergonomic products has never been cheaper so there’s nothing stopping you from trying out a few until you find the perfect fit. For some, they’ll sit on this cushion for 8+ hours a day and so it has to be right, which is why you also need to pay careful consideration to all of the features on offer and find the ones that appeal to your needs. You might start out your search with something simple like the best seat cushion for lower back pain and quickly become inundated with hundreds of products, each one with confusing specifications and features that don’t make sense. Here are some features commonly found on these seat cushions and what each of them can mean for the end result in comfort and support. Does It Have A Back Rest? While this might not be an important feature for everyone, some people find it more supportive and comfortable to have a cushion with lumbar support as well. These usually come as two separate cushions made from the same material and construction, with one to go behind your back and the other underneath you. Back support cushions commonly have an adjustable strap that lets you attach them to the chair so look for this feature when you shop around. Most seat cushions use memory foam inners, however, it’s common to also see other types of dense foam. Memory foam has the distinct advantage of remaining firm even after plenty of use and it reacts to the weight and heat from its user to mold to your body exactly. The most common feature you’ll see on these is a curved shape that lets it fit your body and give ergonomic support which is essential if you’re going to get any real relief. Some come with a contoured surface for extra support, however, there are users who might find this more of a discomfort. A good seat cushion will be able to highlight exactly what conditions they’ve been designed to treat so it’s best to shop for one that can help you. Pregnancy, sciatica, bulging discs, hemorrhoids, hip pain and back pain are a few common ailments these can help with provided they’ve been correctly designed. The cover of your seat cushion is important for comfort, hygiene, and easy cleaning, so look for something breathable and soft. Most covers will be easily removed with a zipper and able to be placed straight into the washing machine, so look for one with easy maintenance features like this. 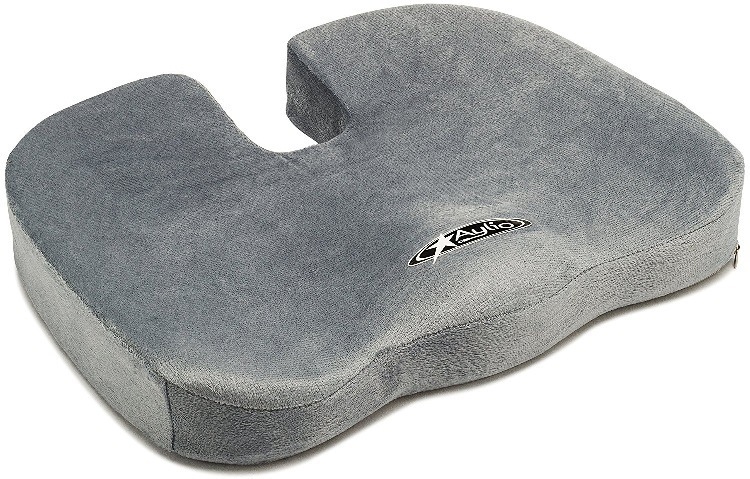 With so many of us now spending hours each day working at desks with computers, the need to invest in something like an ergonomic support cushion has never been more important. Even if you’re not working at a desk all day, the simplest things like driving in your car, traveling on a plane, watching TV or reading still puts so much pressure on our backs and we are always in need of extra support. No matter what type of seat cushion you choose you’ll notice instantly just how much it improves your posture, reduces pain and discomfort and makes things a lot more comfortable. Choosing the best seat cushion for the car, work or one with a backrest means you’ll have all of the support you need and more. Our bodies go through so much in a day and although you might not realize it when you’re sitting down, there can be so much pressure put on our spines just by doing the simplest tasks. 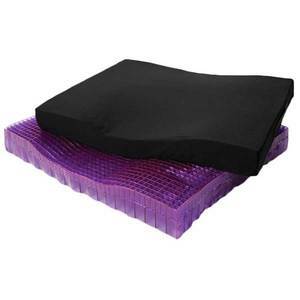 These ergonomically designed cushions are made for this very purpose, and whether you’re using one to relieve pain after an injury or prevent future damage from being done, a seat cushion is the perfect way to achieve it.